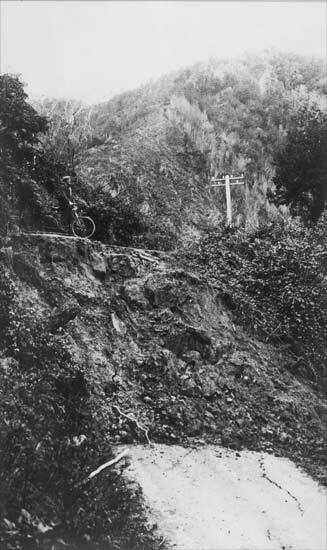 Geologist Horace Fyfe travelled around the Buller region by bicycle, studying the effects of the 1929 Murchison earthquake. This rupture on the White Creek Fault, in the upper Buller Gorge, offset the road by 4.5 metres. Fyfe is standing on the road on the upper side of the fault scarp.